I do love zinnias - they're so cheerful. Glad your surgery went well. I've already had both eyes done and it's wonderful! Good Afternoon Betty, I am so pleased to hear your eye surgery went well. You must see quite a difference now that the cataract as been removed, and your eyesight will improve even more when the second one has been removed. Zinnias are such a beautiful flower, I would describe them as a cheery flower..... as they certainly make me feel happy. Take good care of yourself and I will be thinking of you on Thursday. Betty, Glad you could get a post done with wonderful flowers on your table. I hope this next procedure goes well. Thanks for sharing and have a great week. 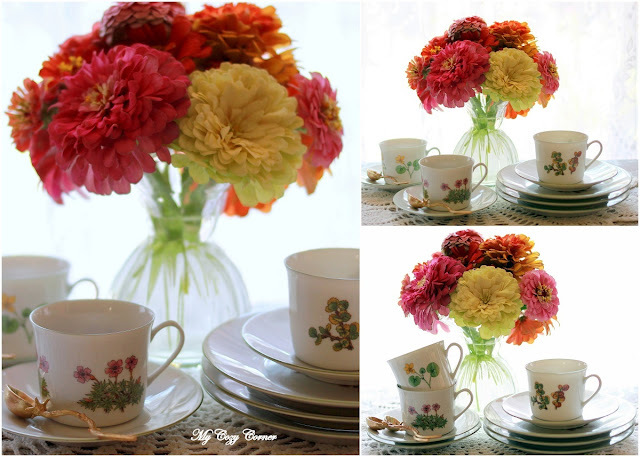 Sylvia D.
Beautiful flower tea set! 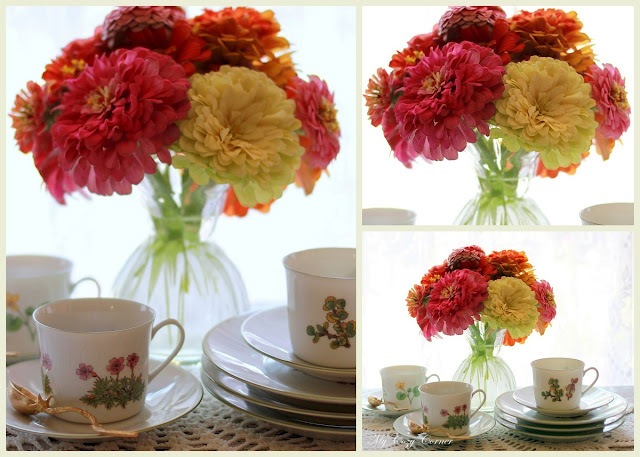 I hope your eye surgery goes well .The zinnias are so pretty for August tea table. Hope you wil come see my post on Seashore tea time! I love Zinnias. Unfortunately mine didn't do so well this year. Maybe it's because of the lack of rain we've had here in Eastern Quebec. Your tea cups are lovely. Thelma. I always think that I don't like zinnias. Then summer rolls around and everything else is cooked, and I wonder why I didn't plant any. I guess I'll just have to enjoy yours! What a colorful and beautiful post! Love the zinnias.Hugs. Zinnias are a favourite in our garden and the dishes are very pretty. Good luck with your eye operation. I hear they are pretty routine these days. Betty, love these photos! I need to plant some zinnias - when I was a little girl, my grandmother and I planted them together. Glad you're halfway there with your surgeries and doing well! Such beautiful flowers!! Hope your eye surgery turns out ok.
Glad to see your lovely zinnia posting and pretty tea wares! Thanks for sharing your beauty! Hope all goes well on the eye surgery. Prayers for "great views"! What pretty flowers and teawares!